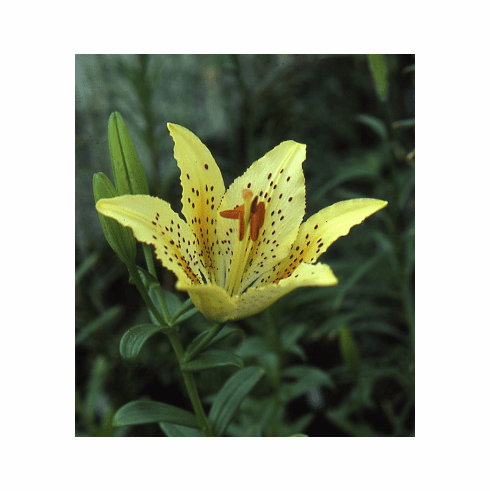 The first notation of the yellow color variant of L. maculatum comes from notes taken at Oregon Bulb Farms. Bulbs of L. maculatum var. flavum were discovered among bulbs of L. auratum var. platyphyllum according to breeder Edward McRae. He reported that this variety was also grown from many years as �Marilynn Ross�. David Stone and Henryi Payne used this color variant heavily in their breeding program in Piedmont, CT. From it came �Nutmegger� and our favorite, �Yellow Blaze� shown in the inset. A very strong grower that is extremely disease resistant. Our first crop of this lovely species was from seed provided by the Ofuna Botanical Garden.